Home / GST-Tally / TallyERP.9 Lessons / How to Calculate Multiple Tax and Print Multiple HSN Code in a Single GST Invoice? 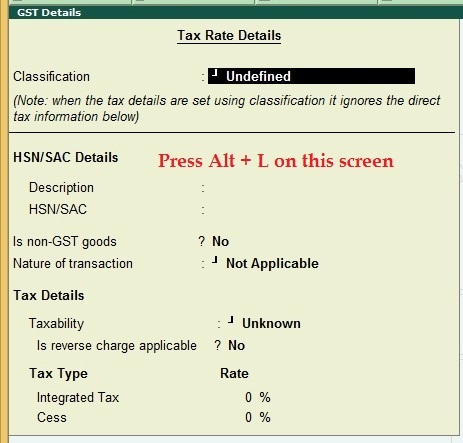 How to Calculate Multiple Tax and Print Multiple HSN Code in a Single GST Invoice? 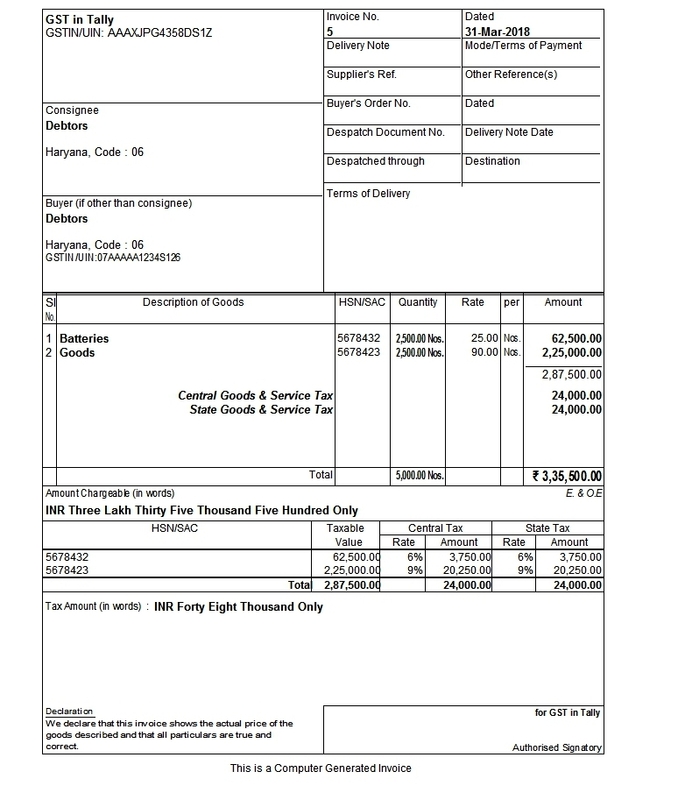 In previous post we know about HSN Code printing in GST Invoice. But what about if you have more than one inventory in the invoice with different hsn code and different tax rates. This is an example of Local Sales having multiple HSN Codes & Multiple Tax classifications. But the matter is how to generate such kind of invoices. When you press Alt + L tax rate history will open on your computer screen. Press Esc or Spacebar to left all fields blank. Press Enter to save the details and ledger account. Now create Inventory or Stock Item. Enter name of Stock Item and under Set / Alter GST Details to yes. 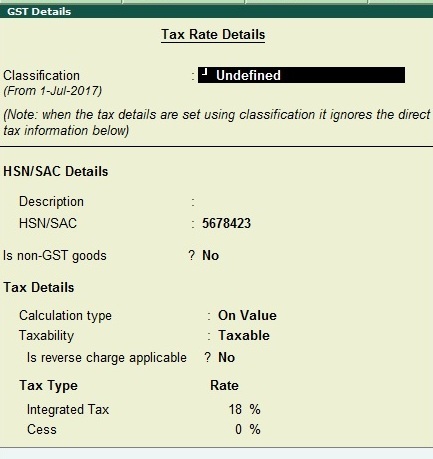 In classification left it is as undefined, Enter description of your product and HSN Code, Select Taxability as Taxable, In Tax Type Enter rate of Tax in Integrated Tax Field, I am entering 12% as example. Create a Invoice Accounting Voucher, Enter Party Name, Local Sales in Sales Ledger, Select Item Name 1 and Item No. 2, Select CGST (Central Goods & Service Tax), & SGST (State Goods & Service Tax) & save the voucher Entry. Go to sales summary or ledger account of the party. Open the sales voucher and select print command. You can see your invoice has two commodity with different hsn and different tax rates. 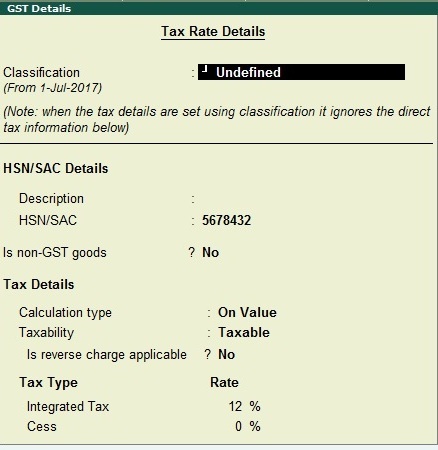 Head wise Tax summary & HSN Summary is showing below description of goods. You can enter more than two or more commodity in a sale invoice.